For anyone who loves sake, the Nada Breweries tour is a must. Going from brewery to brewery and trying the various sakes available is a fun adventure. Some people may think that it is a very boring affair and for those who don’t drink or don’t enjoy sake, I would say this is true. I went with my brother who didn’t think much about going on a sake tour and thought that going to the different Nada Breweries would be boring. What started off as a “boring” tour ended up being a lot of fun. It is very informational to visit all of the breweries as they have various items on display but the main purpose of visiting the various breweries is to get a taste of the subtle differences each brewery has with their own sake. After visiting the first three breweries near Uozaki Station, the breweries start to fan out a little more making it a little difficult to carry all of the sake I bought from place to place. After visiting Kikumasamune, the next brewery on the Nada Breweries tour is Hakutsuru. It is a bit of a walk to get from Kikumasamune to Hakutsuru but Hakutsuru is one of the largest breweries in Japan. They are well known and the brewery museum is located near their production facilities. In fact, the only way to do the tour is to go through the middle of their production facilities. You will be able to see all of the wonderful tall metal containers holding the various types of sake. They require a lot of containers as the brewing season is generally just once a year. Unfortunately, Hakutsuru is one of the underachieving museums in the entire tour in terms of customer service. The entrance is a little intimidating as they do have a security guard at the main gate, but the guard was pretty welcoming and gestured us to enter the museum. The museum itself is fairly large. It was similar to Kikumasamune except they had mannequins that were dressed in Hakutsuru jackets. The Hakutsuru museum is a good place to visit but the shop was my main target. After a quick walk through the museum, I headed straight to the tasting area. I had a chance to try a couple sakes but was left unsatisfied. There wasn’t anyone in the shop that would help me at first. I had to approach someone and ask for advice and even then it was hard to find sake that was specifically sold in only the factory shop. I was a little sad as Hakutsuru is such a famous brewery and they couldn’t spare a little to create some limited edition sake for the factory shop. I did try the regular sake and it was nice, but not exactly what I was looking for. For those going on a tour, you should visit this brewery nonetheless but I was definitely disappointed. The last brewery I visited was the Kobe Shushinkan. Kobe Shushinkan is one of my favourite breweries to visit in Nada. 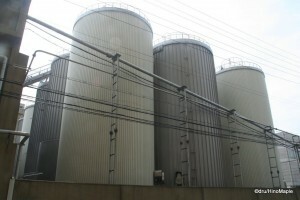 It is a somewhat large brewery and it was very busy when I visited. It is the only brewery that I know of that gives tours of the brewery itself. When I visited Kobe Shushinkan, it was out of season so I didn’t bother trying to visit the brewery itself. The entrance to the brewery is pretty small with a very small garden inside. There are two large old wooden buckets that they converted into benches that make a good photo opportunity as well. There is a restaurant at the brewery as well that I would have liked to have visited but unfortunately I went on a holiday so it was too busy to get a table at the restaurant. When I did go inside the shop itself, I found myself being funnelled into a small dark room. This dark room is the tasting room and there are generally only one to two people inside. I started talking to one person who promptly left the room to get someone who could speak English. This man was very friendly and helpful at explaining the different types of sake available. Kobe Shushinkan does their best to help foreign people as they have information pamphlets available in English to explain the different sake available. It is also the best chance to get information about sake from a real person rather than a video as I had experienced at Kikumasamune. While the person I had the opportunity to talk to may not be there when you visit, it is still your best chance to speak to someone in English as all of the other shops didn’t have anyone who could speak English. At Shushinkan, I had my first ever experience with unpasteurized sake, or nama-zake. 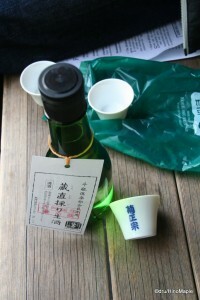 Nama-zake is very special sake that cannot be bought in most places, even in Japan. Almost all sake sold in Japan is pasteurized. 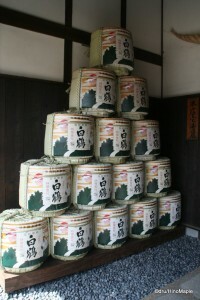 It is very difficult to sell unpasteurized sake as it must be treated like milk. It must be kept refrigerated the entire time or it will spoil. Kobe Shushinkan had every type of sake available in its nama-zake variant. I had a great time sampling the various nama-zake and got pretty tipsy doing so as well. I enjoyed it so much that I even bought a small bottle to enjoy in the small garden outside the factory shop itself. When I made my purchase, it came from a large clear glass bottle that looked like it should be used to hold chemicals. It was a beautiful large bottle and they ladled the delicious sake into a smaller traditional glass bottle where they put a plastic top on it. Buying the nama-zake was fun as it is a special experience to watch them bottle it for you. My only regret is that I didn’t buy a regular bottle of sake to bring back to Tokyo with me. I enjoy sake a lot and I would love to bring some of those flavours back with me. The last place I visited on my Nada Brewery tour was Kobe Konan Muko no Sato. I was let down by this shop as it ended up being nothing more than a shop. It focuses more on pickles and other traditional Japanese snacks with little help from the staff. Most of the clerks would just stand around and let people look at the various snacks on display. It is a good way to end the tour as you can buy some snacks to enjoy with your sake but I was a bit sad as I was expecting more sake. Konan Muko no Sato is not a place that I will ever visit again but if you want to see the other varieties of sake available in Nada, you can visit this shop and get more sake from them. If you are not interested in a simple shop, there are three more places that you can visit when you are in Southern Nada. The first is Takinokoi Kuramoto Club. From what I read, it is a small museum but I couldn’t get much more information about it. I did visit the area and found that the area was bulldozed. I couldn’t find the shop at all so I gave up. Perhaps I just missed it. The other is Nadaizumi Izumi Yunosuke Shoten. 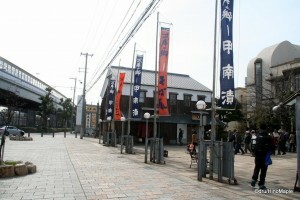 This is another museum along with a souvenir shop. It is located on a main street which is one reason I didn’t visit this shop. The next time I visit Nada I will make it up and visit this shop as well. The last one is Sawanotsuru. It is a large brewery that is located just a little too far for me to walk when I was carrying all of my clothes from my trip to Kansai. While I do regret that I didn’t visit this brewery as well, I wasn’t so sad about it this time. 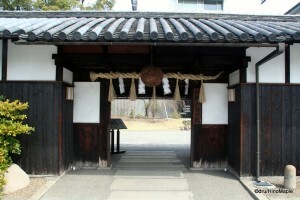 I always have time to go back and visit this Sawanotsuru in the future. The Nada Breweries and Nada district was a pleasant surprise for me. I was very happy to have had the opportunity to do a sake tour. It is something that had always been on my checklist of things to do in Japan. I made a point to force my friends into going and they ended up liking it. I do recommend it to everyone but it isn’t for everyone. The history you can learn when visiting these breweries is very different than when you visit a beer factory. In a beer factory, I feel as if it is a sterilized place with sterile stainless steel as well as a lot of glass preventing me from seeing things up close. 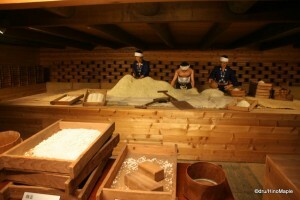 In the sake breweries and museums, you get to be very close to all of the old methods of making sake. Some of these methods are still in use today for the smaller craft shops. It is almost an art to see how sake is made. I love the romance involved in creating sake in the traditional methods. The tour itself can be a labour of both love and pain but worth it for people who love to drink sake. If you don’t love sake, a quick tour of the breweries around Uozaki is more than enough to understand things and you will go away with a lot more than photos and sake. This entry was posted in Kansai, Kansai Food and tagged Hakutsuru, Izumi, japan, Japanese sake, kansai, Kikumasamune, Kobe, Kobe Konan Muko no Sato, Kobe Shushinkan, Konan Muko no Sato, Kuramoto, Muko no Sato, museum, Nada, Nada Breweries, Nada brewery, Nadaizumi, Nadaizumi Izumi Yunosuke Shoten, nama-zake, namazake, nihonshu, sake, sake breweries, sake brewery, sake tasting, Sawanotsuru, Shushinkan, Sumiyoshi, Sumiyoshi Station, Takinokoi, Takinokoi Kuramoto Club, unpasteurized, unpasteurized sake, Uozaki, Yunosuke by Dru. Bookmark the permalink. I thought I replied to this… Guess not…. PS: Thanks for the compliment on the last paragraph. I really want people to go, although I think first timers to Japan may not want to go. It can be a bit difficult to find your way around. I had to use my phone once or twice, but there are good maps out there. I can tell with your Shikoku Mura posts. Very informative, even if I don’t reply. ^^ Hope you can try it someday. Wow, this is what I will definitely call a tour. I love sake myself, and all these Japanese wine is making me want to call my buddies and take a tour myself (and hoard a bit along the way as well, LOL).